Summer has finally arrived in Chicago, bringing with it hot and steamy temperatures and stormy forecasts. The National Weather Service has issued a heat advisory for the entire Chicago area. The advisory is in effect from late Friday morning until 8 p.m. Saturday for LaSalle, Grundy, Kankakee, Livingston, Iroquois and Ford counties and will take effect in all counties from 10 a.m. to 8 p.m. Saturday. The advisory warns of peak heat indices near 110 degrees. NBC 5's Byron Miranda asked Chicagoans what they plan to do to stay cool as a heat advisory overtakes the city this weekend. Officials warn that residents should take extra precautions when spending time outside and drink plenty of fluids. 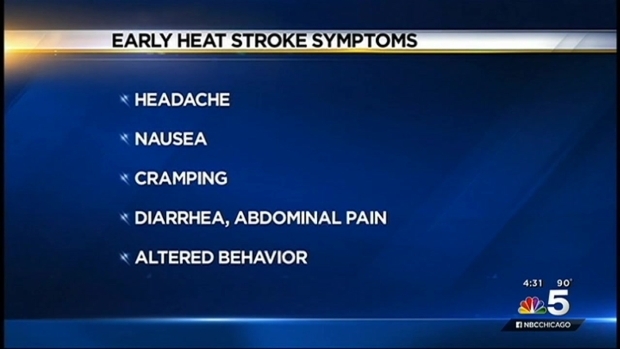 When possible, officials say you should stay out of the sun and in an air-conditioned room. The Office of Emergency Management in Chicago is expected to issue a warning to residents ahead of the extreme heat. Doctors and city officials warn Chicagoans to be careful in the intense heat as the city holds many outdoor concerts and festivals this weekend. NBC 5's Anthony Ponce reports. Temperatures and humidity skyrocketed in the Chicago area Friday, bringing high temperatures near 90 degrees. High humidity levels will have heat index values reaching from the 90s to 100 degrees in some areas. Partly sunny skies could give way to a few scattered showers and storms in the afternoon, with storms capable of producing heavy rain and damaging winds. The hot and stormy forecast holds through the weekend, with the risk for severe weather possible until Sunday. A chance of isolated showers and thunderstorms continues on Saturday for what should otherwise be a partly sunny, hot and humid day. Highs are expected to reach the upper 80s to low 90s, but it will feel hotter with high humidity. Heat Index values could range between 100 degrees and 105 degrees. The hot weekend continues with a hazy, hot and humid Sunday producing highs near 90 degrees and hotter heat index values. Showers and thunderstorms are possible during the morning hours. Monday kicks off a less humid week with highs in the low- to mid-80s.